Following the sell-out success of the classically structured 2014 vintage of Farr Vintners Pauillac, we are delighted to announce that the 2015 vintage has just arrived in stock and it’s better than ever. This vintage has the added advantage of being more forward and plump thanks to the extra ripeness of this excellent year. As regular customers will know, this wine is made and Château-bottled by one of the world’s greatest wine producers in their vineyard in the heart of Pauillac. We buy and sell it at a very advantageous price on the understanding that we do not reveal who makes it! 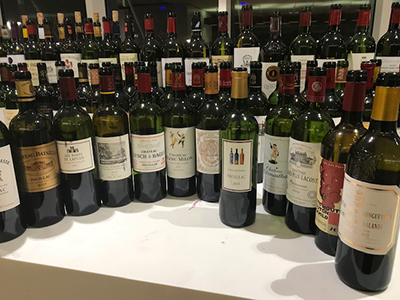 The 2015 Farr Vintners Pauillac made its UK debut at the annual ‘Southwold Group’ tasting last week amongst 263 other Bordeaux wines of the 2015 vintage. Very few of the wines in the tasting are available at as low a price as this but, nevertheless, it out-scored several classed growths that sell for twice the price or more. As our customers will be aware, 2015 is a very good Bordeaux vintage with many outstanding wines in it, but the great advantage of this year is that the wines have well rounded, smooth tannins and, apart from those at the top end of quality and price, are forward and surprisingly approachable. Wines such as this will be drinkable in their youth but age well over the coming years. A report on the 2015 tasting can be found here. At £180 per dozen in bond we are absolutely confident that you cannot find another wine from the great appellation of Pauillac of this quality and pedigree at such a modest price. "Deep ruby in colour, with a plush, rich and juicy nose of black fruits and toasted spices. The palate has a core of ripe cassis and black cherry, layered with soft, ripe, integrated tannins that make this wine much more approachable than the 2014. Sweet vanilla, nutmeg and clove add layers of complexity through the mid palate, which is silky and builds in savoury character. The finish is long, supple and moreish. Perfect to drink now, or over the next decade. This wine showed well in the 2015 Southwold Group tasting, beating many classed growths."